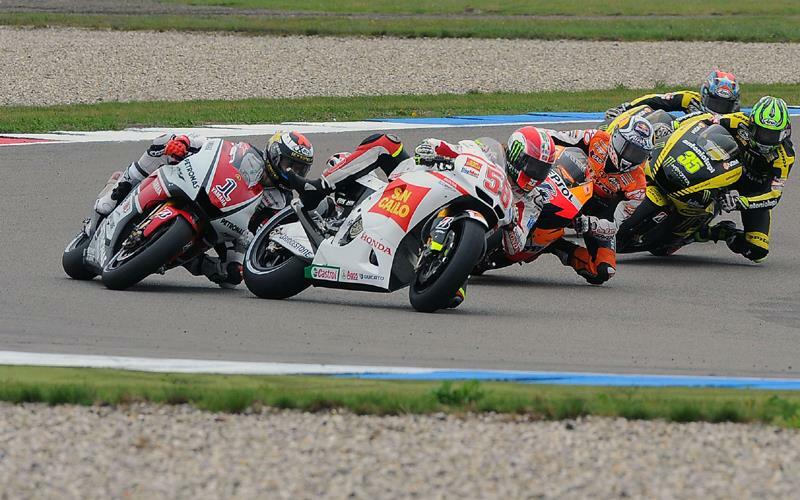 ﻿ Did Marco Simoncelli reject soft tyre offer in Assen? Did Marco Simoncelli reject soft tyre offer in Assen? Suspicions about who rebuked Bridgestone’s offer to use a softer compound rear tyre in Assen last weekend have pointed to controversial Italian rider Marco Simoncelli. With numerous riders complaining about the warm-up performance on the left side of Bridgestone’s soft compound option in Assen, the Japanese factory hastily arranged for a softer tyre to be delivered in a truck from Germany in time for Saturday’s race. But it could only be used with the unanimous agreement of all teams, so when it emerged that the offer had been rejected, the finger of blame immediately pointed to Repsol Honda. But Casey Stoner denied he or HRC was involved and he said: “I don’t know. Franco (Uncini) came into my motorhome explaining the situation. I thought if it’s going to be cold weather then it’s a good idea. But if it’s going to be hot weather I want the harder selection. Valentino Rossi’s crew chief Jerry Burgess though hinted the refusal came from Simoncelli, who had qualified on pole position for the second time this season. Speaking to MCN after Rossi finished the 26-lap race in fourth place on the new GP11.1 Desmosedici, Burgess said it was his belief that Simoncelli had knocked back Bridgestone’s offer of the softer tyre. If it was Simoncelli, then it was a decision he probably regretted as he crashed out on the first lap while pushing too hard before the left side of his tyre had reached peak working temperature. Burgess said: “I’m not sure if it is true but it is my belief that it was Marco’s lot that prevented us from getting the additional tyre that was softer on the left, so I said if it was him that vetoed it he would look a bit of a bunny if it went wrong and he lost it on the left hand side.